This is part two of a post called American Heritage Flood Job. My client had his game room flooring replaced due to a leaky toilet. This is the second leg of the new flooring move. 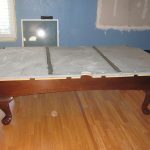 We went back this week to setup the pool table on top of new hardwood floors. 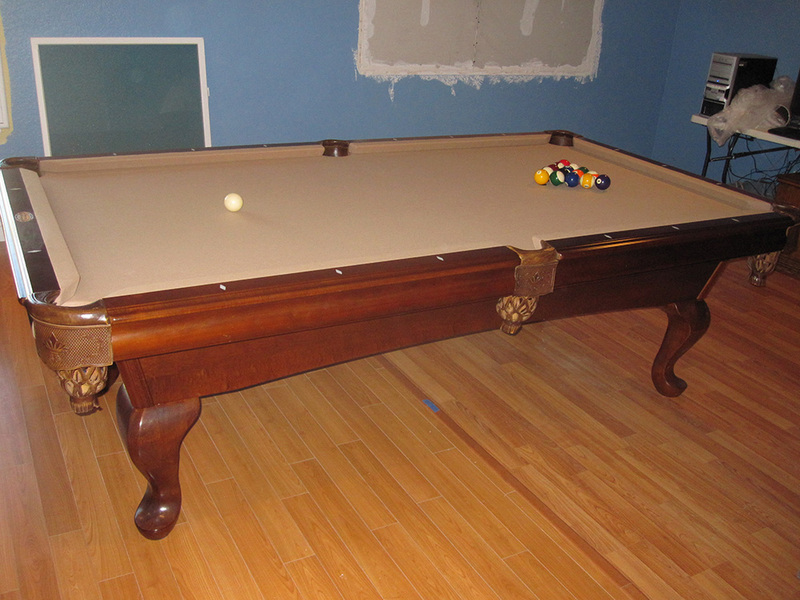 Whenever we level a pool table on wood or other hard surface floors. 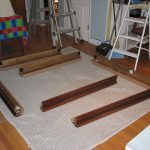 I always use rubber shims, not only to protect the floor but also to keep the table from shifting or sliding under enthusiastic playing conditions. We have rubber shims that range in thickness from 1/4″ to 1/32″. 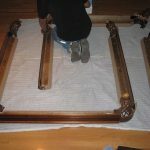 We can usually level any pool table despite an uneven floor. 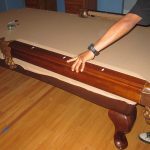 My client also had a talk with his wife about the “dead” cushion on this American Heritage pool table. The Mr. brought the rails into the shop a few days after we had disassembled the pool table and moved it to the garage so their new floors could be installed. Luckily there was enough extra rail cloth left untrimmed on the rail bottoms to re-staple. Replacing the rail cloth was unnecessary.